Cody has been embarrassed by our old dining chairs for a long time now. Since we have a new-to-us dining table, I wanted to use the old one downstairs as an area for the girls to do art projects and games. Since nearly everything in the basement is new, adding these stained dining chairs was not an option for me. 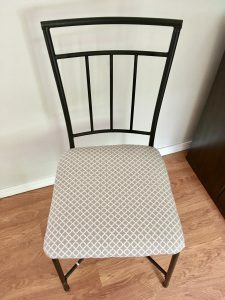 I decided that since I had reupholstered the little girl’s table (check out the results here, it couldn’t be much different to reupholster our dining chairs. I was right. It was simple, and I was able to use things I already had (staple gun/staples and fabric) and only had to buy the clear plastic covering to allow my little ones to spill without ruining my hard work. 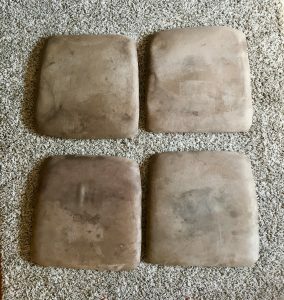 Here are the really stained chair seats right before I decided it was time to reupholster them. This is the fabric that I had on hand from a photography backdrop that didn’t work. 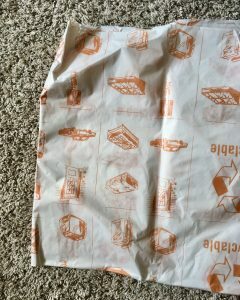 This is the clear plastic I ordered through Joann’s to cover the fabric. 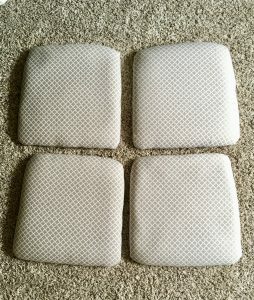 Here are the seats after I stapled the fabric and plastic covering on. I didn’t take off the original stained fabric before, which I could have done. Here is a new chair ready to conveniently wash off when a child spills on it! It looks much better and functions well too!